ADC’s line of single-patient-use blood pressure cuffs was redesigned in 2016 with a focus on precision, comfort, and value. Cuffs are available in both adult and neonatal sizes. Made from a woven polyester fabric, the color-coded cuffs are exceptionally soft and comfortable, and feature the meticulous marking system that make our products the most accurate and easy-to use available today. And our standardization solution is the simplest yet. Choose a one-tube cuff with a bayonet connector or a two-tube cuff with a screw connector. 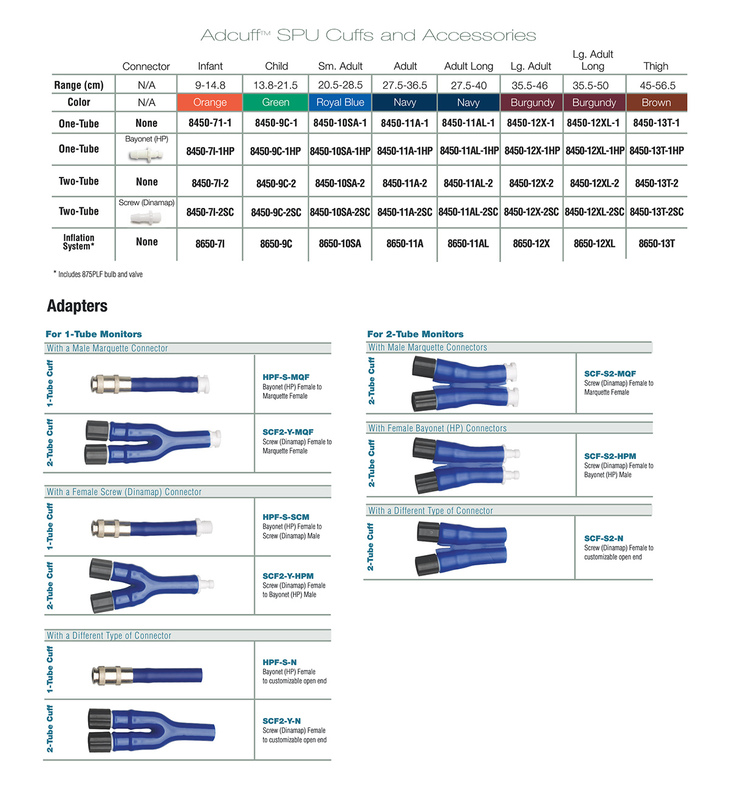 If needed, straight, X, or Y adapters can be added to connect the cuff of choice to virtually any monitor on the market. It’s a flexible, non-proprietary solution that’s compatible with most major monitor brands. Our line of single-patient-use blood pressure cuffs has been completely redesigned with a focus on precision, comfort, and value. Cuffs are color coded and available in both one- and two-tube configurations.